Like most moms I spend my day juggling. I juggle my part-time job, the kids schedules, house chores, cooking, friends, blogging, product reviews, and more. Yes, guys I know you do too and kudos to you but a lot of guys have no idea the amount of juggling moms do. While you guys head out to work and deal with that part of life so your family has a roof over their head, many moms are doing what they can to make sure everyone is happy. Sometimes this means putting ourselves why at the bottom of the list. Waaaayyyyy down low. Meals are also way low on my list....I don't have anytime to think about this especially for myself. I can't tell you the amount of times I wonder why I am hungry and remember it is because I haven't eaten. Who forgets to eat? The last time that happened was right after the births of both my babies. I want to eat. 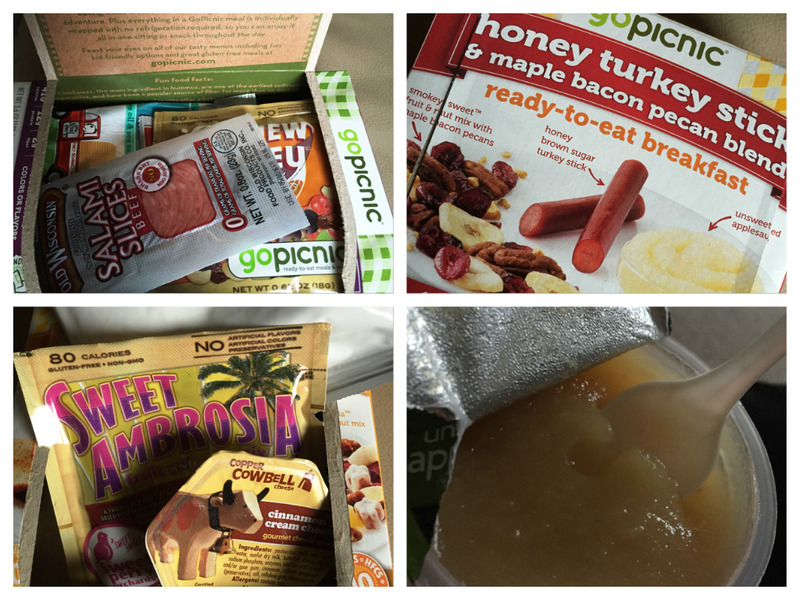 It is just the constant rush which is why I am so happy to have been able to check out a company called GoPicnic. 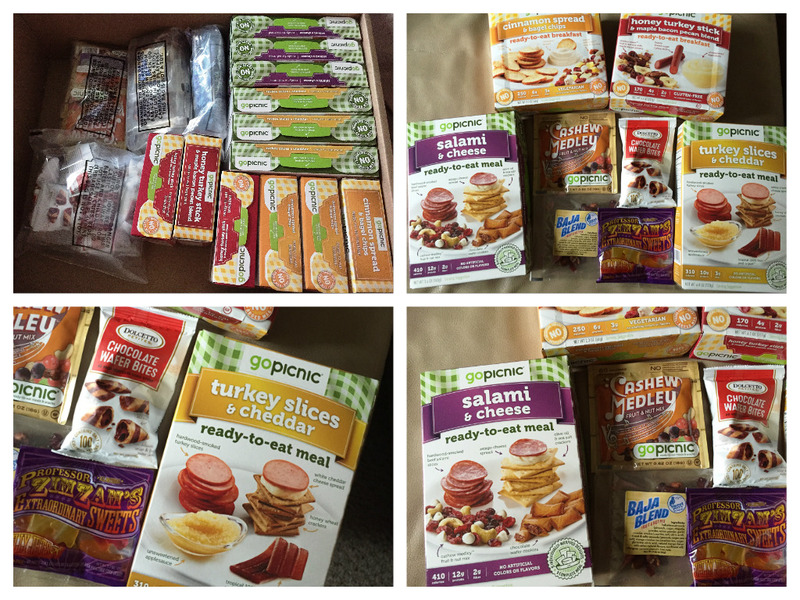 Go Picnic has boxed meals and snacks for when you are on the go and honestly, who isn't always on the go?! There are so many choices and they have been a complete Godsend. I have tossed them in my tote bag when I am working, tossed them in my daughter's lunch box even tossed three in my car for whenever we need something during our mad rushes and I don't want to spend money at a fast food place. The meals are delicious and free from trans fats, high fructose corn syrup, added MSG, artificial flavors, or colors! Also, box lunches are no bigger than a novel and fit in almost any bag! The Meals all come in boxes which has a color photo of everything included in the box, nutritional value which is broken down and super easy to read, and even the inside of the box is used as it contains a game. The prices for the meals run around $3.99 a box but you can also get them in bulk, there are special running all the time or order a subscription and get a 20% discount every month. You can order by meal type or diet type as well such as Vegan, Gluten Free, Kosher, Non-GMO and more. The meals come with a few items in each box. For instance a meat stick, cheese spread, crackers, and a snack like nuts or applesauce. Everything is individually wrapped and actually taste great. My kids went through anything that had cheese and crackers very quickly. My favorite was the Turkey Stick! I loved everything except the cinnamon spread. Not sure why I didn't love it. I guess I expect it to be like my cream cheese but mine cream cheese is high in fat but I love my cream cheese and will eat it regardless of the fat.